What an ugly way to wake up on a holiday morning. 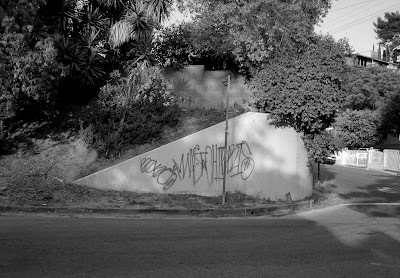 Big, gross, angry, no style, lame graffiti all over lower Montecito Dr. Not even worth showing it in color. As I drove farther up Montecito Dr. there was even more on some walls that don't usually get tagged. A couple of local residents were already painting over the graffiti. Big thanks to them and to anyone who regularly paints out the graffiti on the hill!